You are here: Home / Culture / Trust – Assuming the best or moving on? However, there is an innocence about her that is more than a bit intriguing, and watching her play brings me joy. No, this is not a column about dogs, or dog training, but permit me to relay a few recent thoughts enroute to what I hope will be insightful and encouraging for you. I have been connected to Maddie for over 3 years now. Most of this time the connection has been as adventure companions. Snowshoeing in the winter, hiking in the summer. More recently I take her for a daily swim (she swims, I watch). During the colder months this past winter, I started sneaking her indoors. This did not go over well with my wife initially. Firstly, Maddie is over 100 lbs. This combined with her ADHD makes indoor adventure a bit less than appealing at times, especially if she happens to be wet! Secondly, I have a dog allergy! It actually ranks as dangerous for me to have a dog in the house, though, oddly enough, I appear to be building immunity through repeat exposure. In spite of these significant issues, I would like to have the dog in the house more, and the only way I can see this happening is for us to come to a place of trust. If we can trust her to stay on the mat at the door, then she will be permitted to come inside more often, maybe even regularly – which would likely make two of the three of us very happy! I have been reflecting on the issue of trust often of late. It is essential for pets and owners, kids and parents, customers and suppliers, and also for employees and employers. During several of my former posts as CEO, I remember coming to places where I felt that I did not know who to trust. Too many varied opinions, and too many instances wherein performance did not match words spoken or where actions were inappropriate given the severity of the situation. I wish I had known then what I know now. Trust is granted, not earned. There is no magical quota of earnings wherein anyone can know that they have “earned” trust. We make a decision to trust. Trust necessitates that we assume the best of others and hold them in unconditional positive regard. If we feel that we cannot trust, then maybe the one in question is not trustworthy. If this proves to be the case after exploration, then there may need to be a parting of ways. If we do not act in ways that are trustworthy, then there is no foundation for relationship. It is impossible to assume the best when the assumption constitutes stupidity or naivety. Trusting does not guarantee that there will not be conflict, or that we will always understand the other – nor does it insure against mistakes wherein feelings of trustworthiness will be broken. We will make mistakes. We will be in conflict at times. Conflict is even necessary to help us see what we cannot see in ourselves, in others and in situations and circumstances. Trust should not be based in circumstances alone, but rather it is a blend of hope and confidence in character. If we note character in someone, but are not able to bring our self to trust, then maybe the problem is within us. Maybe an inability to assume the best in others is based in a spirit that has turned cynical, critical or unforgiving. However this plays out for you, on whichever side of a trust breach you stand, whether you have been the one to breach, or have felt the impact of another’s breach, know this: without trust, there is no foundation. 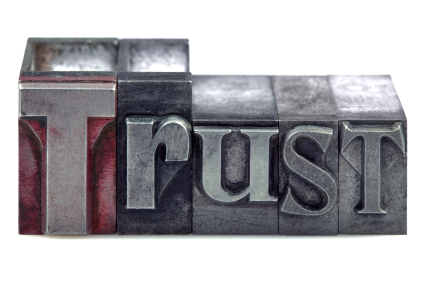 Mission, vision, values, practices, systems and policies are all rendered impotent without trust. Work toward reconciliation, and if you find that there is a lack of character on the other side, you may be looking at a parting of the ways. I hope for more for you than parting. I hope for reconciliation and the discovering of firm foundations. If breach is acknowledged for what it is, and if the parties involved will own their breach and hold themselves and each other accountable for their part in reconciliation, the feelings of trustworthiness can be restored, and trust can be granted freely.